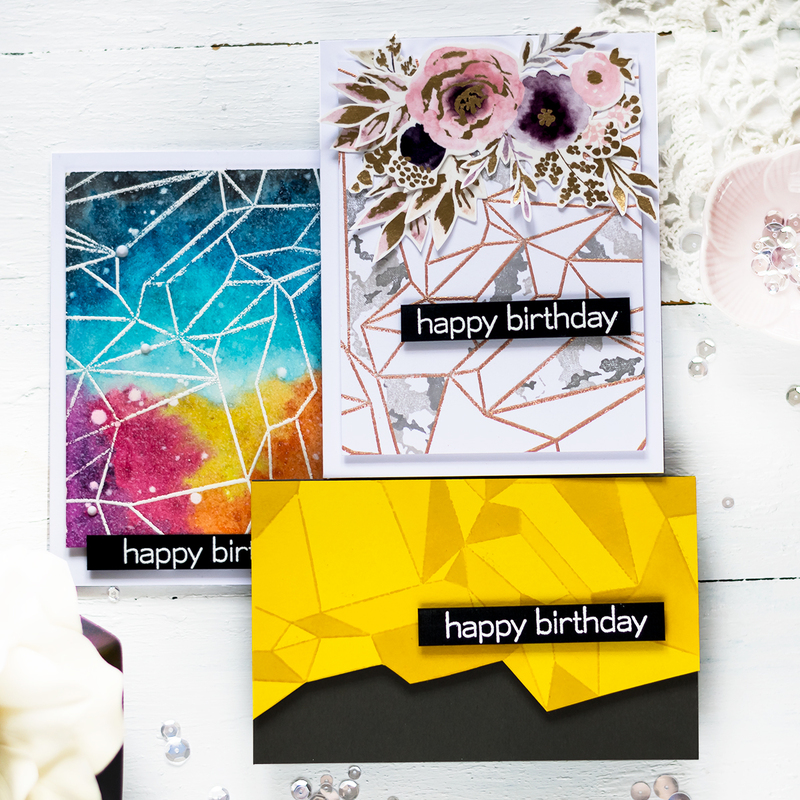 Studio Katia is sponsoring A Blog Named Hero this month and to support this collaboration I made two cards using supplies of both Studio Katia and Hero Arts. 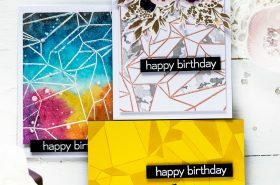 Being fan of Hero Arts products and it was so much fun for me to make cards using products of both companies. My first card was inspired by Passengers movie that was release recently. I thought it could be fun to use Studio Katia Stitched Loops Die as a spaceship windows (or whatever they’re called on a spaceship) through which one can see the Space. 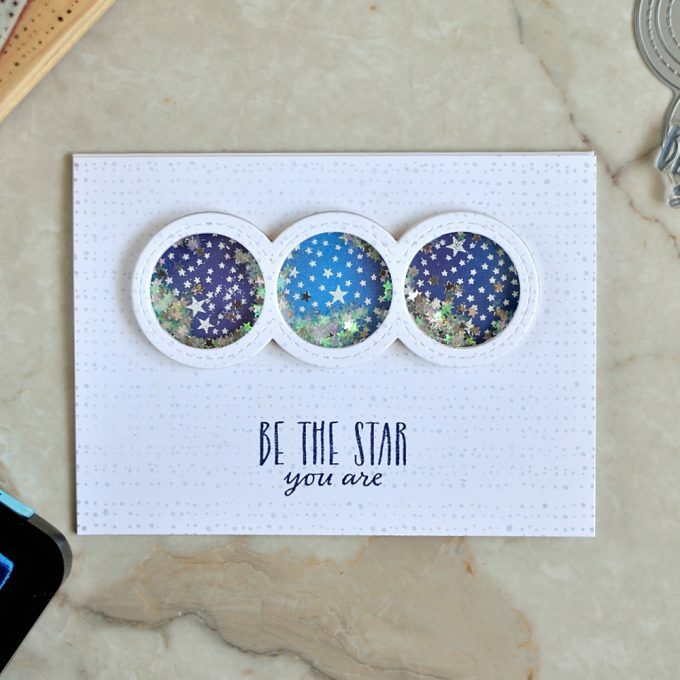 I started making my card by stamping Hero Arts Tiny Ink Spots background using Hero Arts Stone Wash Ink onto a Solar White cardstock. I think this background works well for a spaceship interior. I particularly very like backgrounds like these. 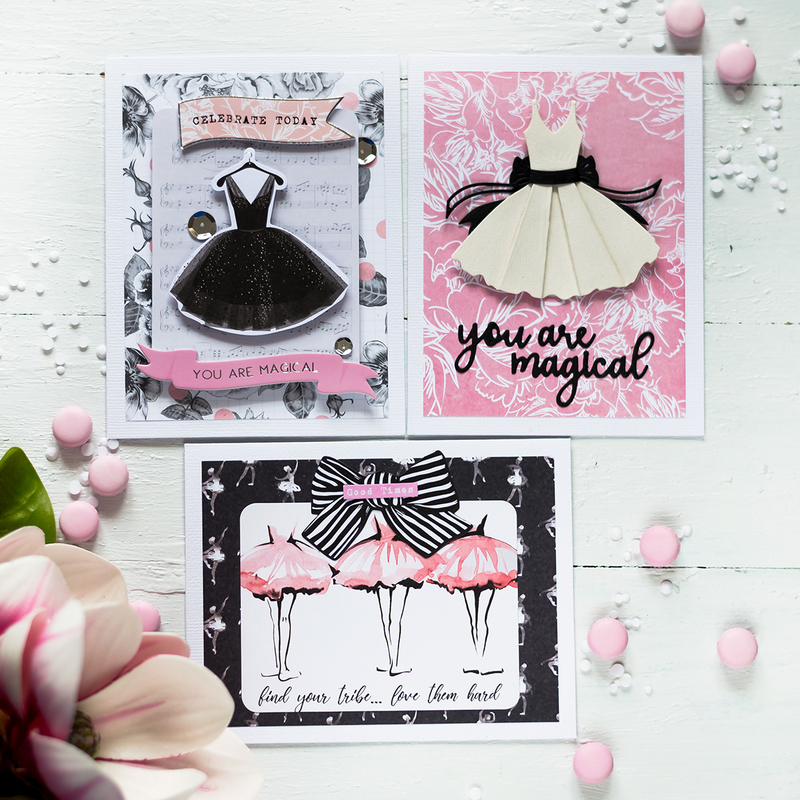 They’re not too much into your face, they won’t overwhelm a card, but often can add that missing touch to a background. 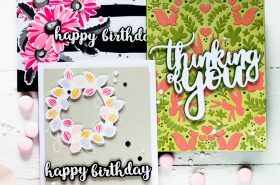 Very often if I feel that my background needs something I consider using backgrounds like these stamped with light ink. Then I cut Studio Katia Stitched Loops out of the stamped background and using its negative space marked the area onto a white card base that would be seen through this die cut and created a space piece within this area. To do this I first added some ink blending using Chipped Sapphire, Salty Ocean and Seedless Preserves distress inks and then white embossed Hero Arts Tiny Star Background. This is another of my favorite backgrounds that I tend to reach often. This stamp sadly is discontinued already (as you can guess I got it many years ago), but it still can be found on Amazon and other stores (and of course eBay and different craft destashing resources). Other companies also have similar stamps. My point is that it’s useful to have a couple of such backgrounds in your stash. 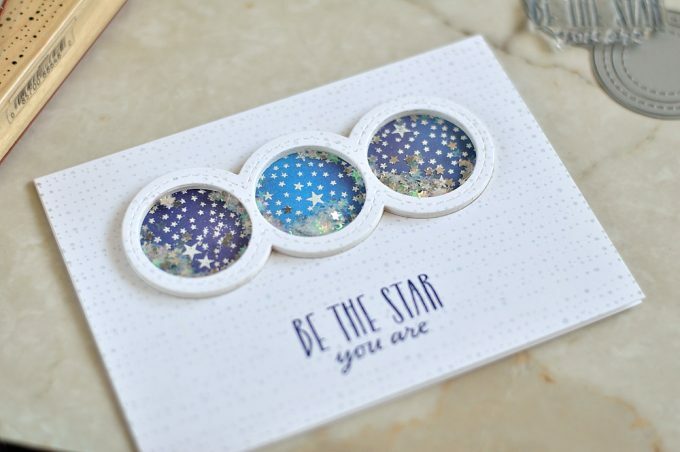 I created a shaker using Studio Katia Stitched Loops die cut that was cut before from the background, placing Studio Katia Iridescent Stars Confetti and Studio Katia Silver Stars Confetti inside. 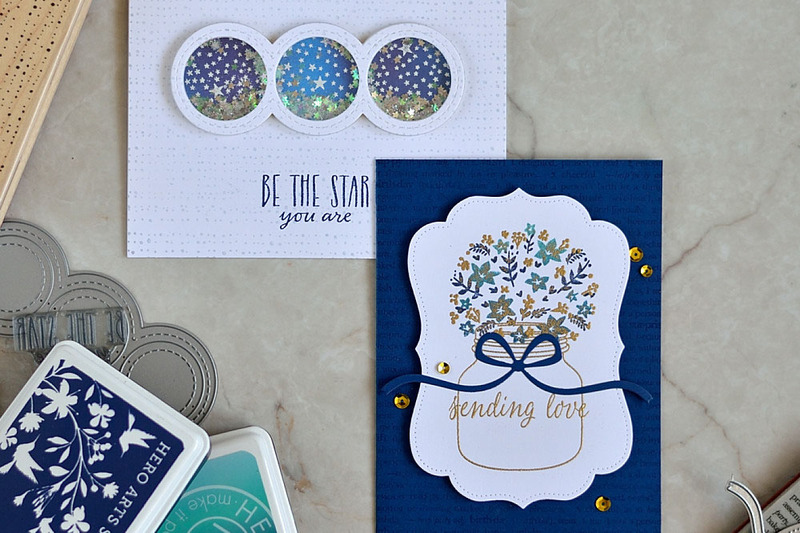 And added a sentiment from Hero Arts Written in Stars set using Hero Arts Navy ink. My second card is more classy and traditional if you wish. 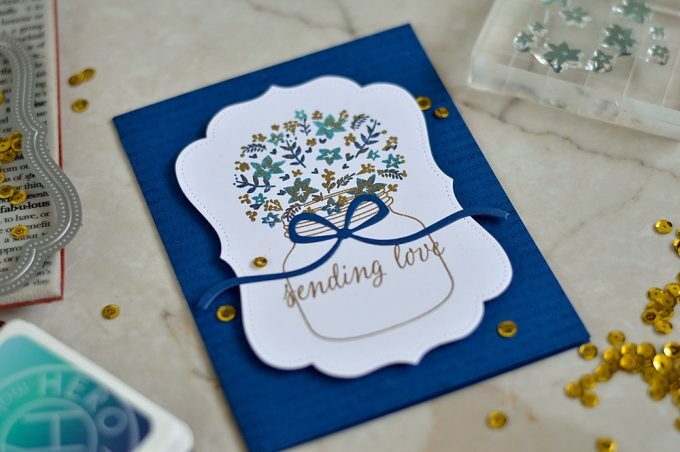 To start off I stamped a Hero Arts Layering Bouquet onto a Solar White cardstock. 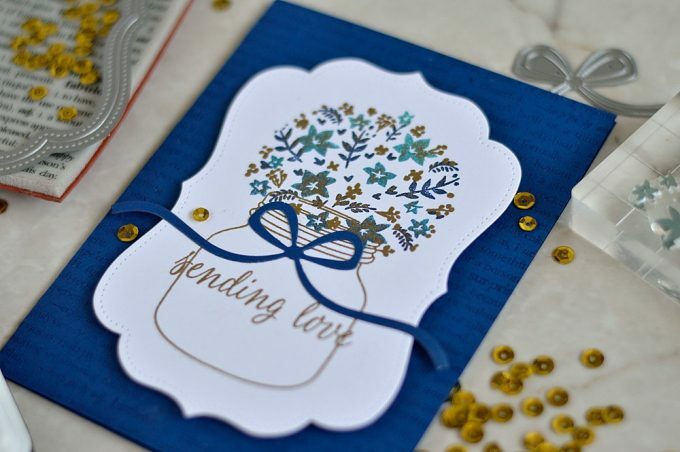 I used Hero Arts Navy ink for the greenery level, Hero Arts Pool to Navy Ombre ink for the bigger flowers layer and gold embossing for the smaller flowers level. 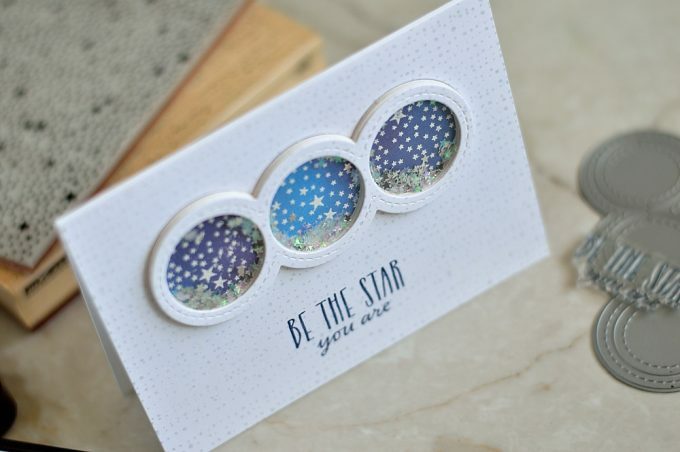 After I stamped the first two mentioned layers I didn’t let ink to dry completely in the core of the cardstock and poured embossing powder right away. This way it stuck to the stamped design a bit adding kind of one more layer to it. 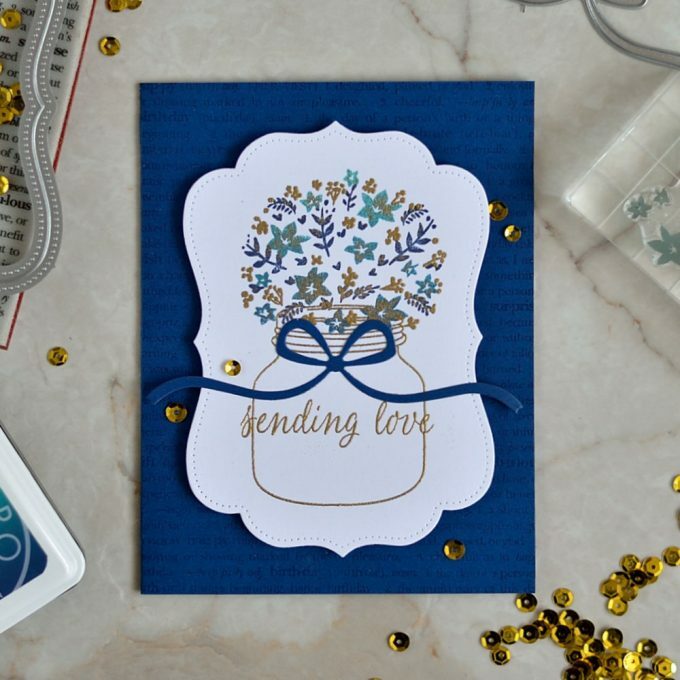 Next I gold embossed a jar from Hero Arts Winter Scene set, as well as a sentiment from Hero Arts Layering Bouquet. And cut the cardstock with my stamped-embossed design using a frame from Studio Katia Darling Ribbon And Dotted Frames set. 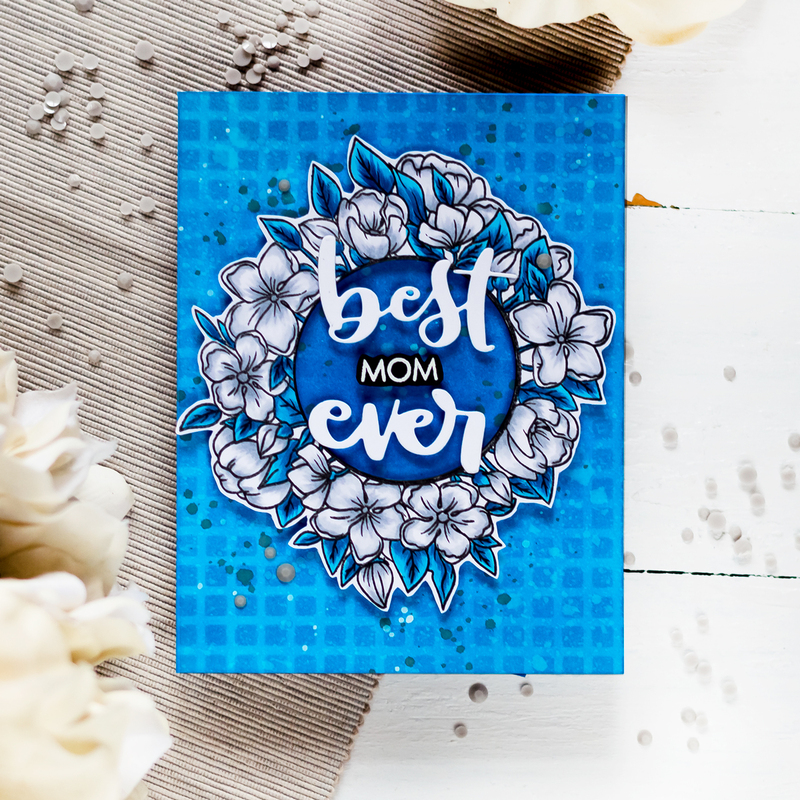 I cut and scored a side folding A2 card out of Bazzill Whirlypop Cardstock and stamped Hero Arts Happy Definition Background onto it using Hero Arts Navy ink. After that I foam mounted the die-cut frame onto it. 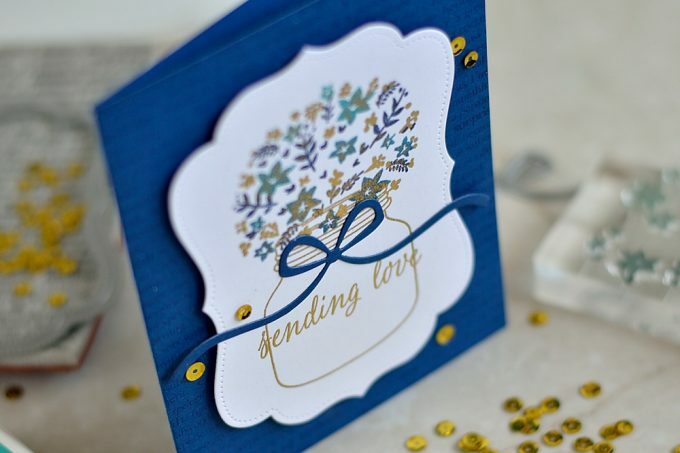 To finish off my card I die-cut a bow using a die from Studio Katia Darling Ribbon And Dotted Frames set out of the same Bazzill Whirlypop Cardstock and adhered several gold sequins. 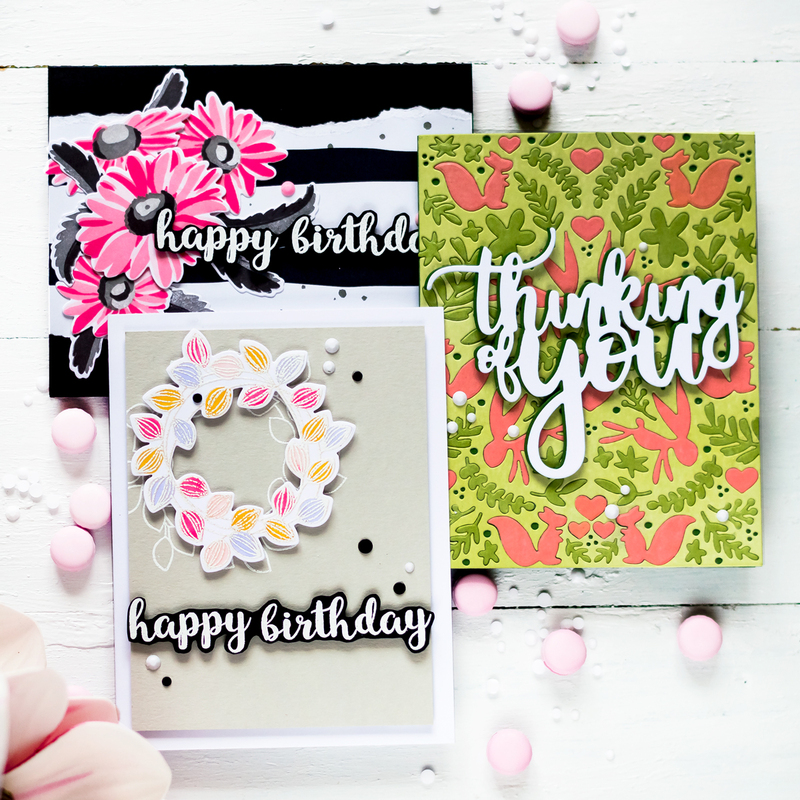 It was so much fun working with supplies of these two companies which products I love. Nice! Both cards look great. The shaker card is so much fun. I also love the dark blue & gold together.